We would like to sincerely thank you for taking part in the 9th Annual Forum of the EU Strategy for the Baltic Sea Region. We hope you took many great ideas and contacts with you to strengthen and develop the Strategy. The Forum was hosted by the Ministry of Foreign Affairs of Estonia together with the Baltic Development Forum in close cooperation with the European Commission, Ministry of Environment and other partners. 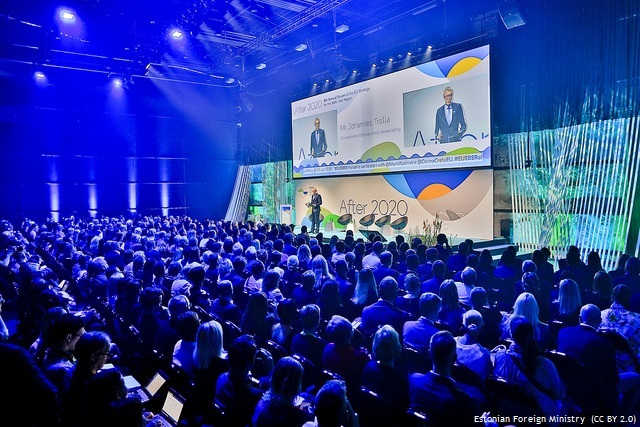 About 800 participants from governments, international organisations, NGOs, universities, local and regional administrations, media and businesses came together to discuss developments and challenges in the Baltic Sea Region. The 9th Annual Forum was co-financed by the European Union Interreg Baltic Sea Region Programme. The main theme of the 9th Annual Forum was the Baltic Sea Region After 2020. The Forum discussed how to improve the implementation of the EUSBSR in the framework of the future EU Cohesion Policy. It discussed also the current state of the ecosystem in the Baltic Sea as well as how to advance the Region as a global digital hub. The Ministry of Foreign Affairs of Estonia and the Baltic Development Forum would like to thank all cooperation partners: speakers, moderators, organisers of plenary sessions, seminars, networking area and speakers corner and the DG Regio of European Commission, EUSBSR national, HA and PA coordinators, Estonian Ministry of Environment, City of Tallinn, Estonian Association of Estonian Cities and Rural Municipalities, Spatial Foresight, Let´s Communicate, HA Capacity, Amazing Production, RGB Baltic, Carmen Catering, Meta Advisory, Zavod BBDO, Tallinn Creative Hub and Estonian Maritime Museum for their excellent contribution and cooperation.